Highlands Houses, 19" x 19"
It was one wrong turn after another with this quilt, and the challenges continued with the quilting! As a beginner free motion quilter, I decided to do a loose stipple with fine thread, and let the quilting fall into the background. My practice pieces looked reasonable, but it all went out the window once the real quilt was under the needle! 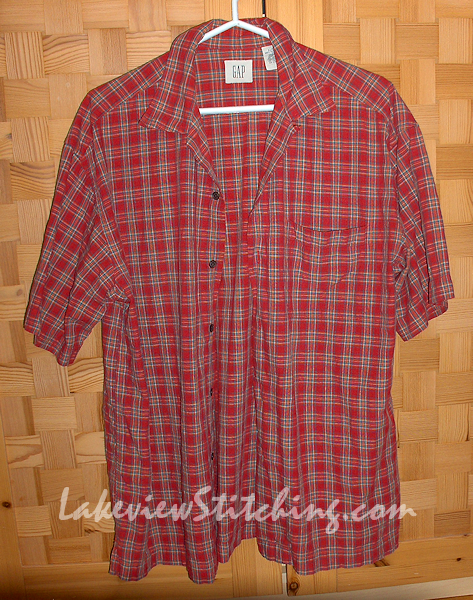 Shirting is stretchier than regular quilting cotton. Paper pieced blocks are stretchier than traditionally pieced blocks, because the grains are not usually lined up. So, there are a few bumps in the middle, and a few tucks under the binding, but at this point I'm going to call it a day and move on to the next project! Three quilts done, a gazillion to go! Your little wall hanging of "creativity due to circumstance" looks fantastic. Another successful finish. Congrats! I think it looks great! Congratulations on a finish! There is a saying that I have heard in the quilting world, that goes something like this, " If it looks good while riding by on a galloping horse, it is perfect"
I think it looks great, Monica and congratulations in finishing what was clearly a challenging project. It is a brilliant concept and quilting really works to set it off. 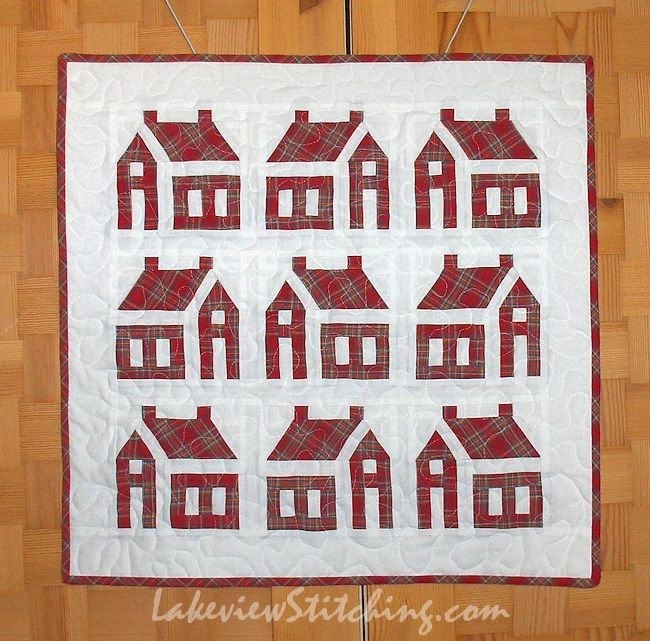 One certainly can't tell by looking at your wonderful Highlands Houses quilt that it was a challenge. It looks terrific and how nice to use something that was your Dad's to make it. Congratulations on such a nice finish. Love your Highlands Houses! Great way to use a rescued shirt. It has come together wonderfully! I love it. Perhaps a good spray of starch would help next time with the shirting fabrics. Would certainly stiffen them up. Thank you, Katherine! I have not tried starch at all, but I think it's something I'm going to have to explore.